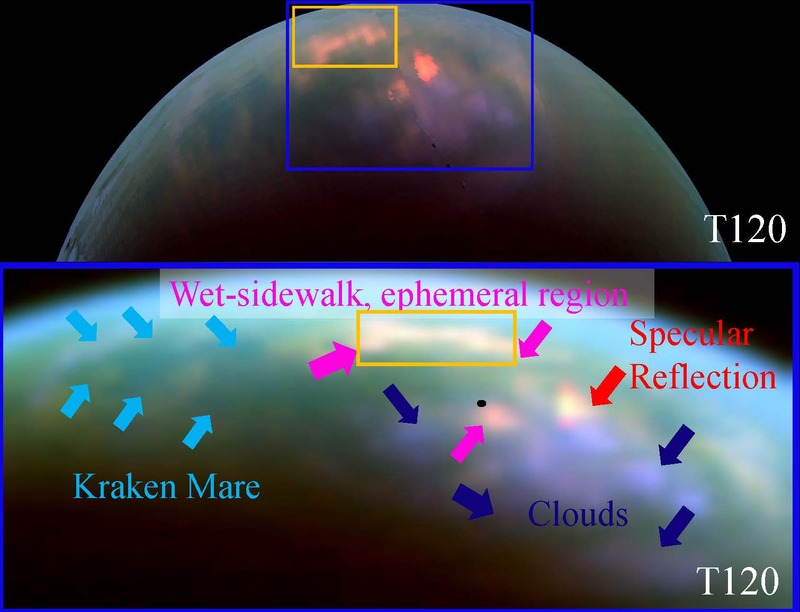 Two new studies published in Nature Astronomy on April 15, 2019 unveil new clues or conclusions regarding the structure, the nature or the dynamics of the lakes of Saturn's largest moon Titan. The first study entitled « Deep and methane-rich lakes on Titan » and led by Marco Mastrogiuseppe, who is a Cassini radar scientist at Caltech in Pasadena, California, reveals the identification of deep lakes rich in methane on top of hills in the high latitudes of the northern hemisphere of the Opaque Moon. The second study entitled « The case for seasonal surface changes at Titan's lake district » and led by Shannon MacKenzie, who is a planetary scientist at the Johns Hopkins Applied Physics Laboratory in Laurel, Maryland, reveals the identification of lakes which may have evaporated during the Cassini mission in the north polar region of that enigmatic moon. The research work was partly based on data obtained during the final close flyby of Saturn's largest moon performed by the Cassini orbiter on April 22, 2017. During that flyby, we obtained radar data unveiling the small lakes of hydrocarbons found in the northern hemisphere. The new analyses reveal or confirm that the small lakes identified on top of hills in the high latitudes of the northern hemisphere are remarkably deep and are composed of methane. The small pools of hydrocarbons studied by the planetologists can be more than 300 feet or 100 meters deep. Thanks to these analyses, researchers are in a position to have a better understanding of the dynamics of Titan's lakes and of the hydrological cycle of the Hazy Moon. The new clues allow scientists to better analyze the processes of evaporation, condensation and precipitation as well as the way the exotic liquid seeps into the soil. Researchers can draw a parallel between the hydrology of Titan and the hydrology of our planet even if the hydrology of Titan is mainly based on methane whereas the hydrology of the Earth is based on water. In fact, to our knowledge, the Earth and Titan are the only worlds in the Solar System containing stable pools of liquid on their surface. Cyclones, cloud systems and rainfall can take shape on Titan like on Earth. The key molecules of the hydrological cycle of Titan appear to be methane and ethane which can appear in their liquid form on the surface. 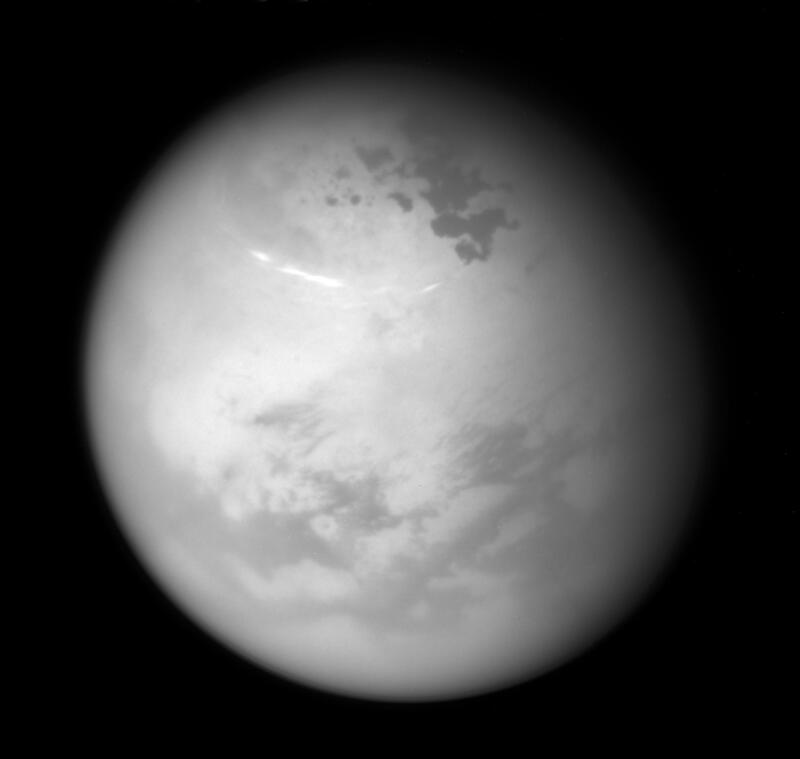 The image above reveals a near-infrared view of the disk of Titan unveiling, in particular, the land of lakes in the north polar region of Saturn's largest moon. The view was obtained with the Narrow-Angle Camera of the Cassini orbiter on June 9, 2017. At the time of the observation, the northern hemisphere of the Orange Moon was experiencing the start of the Summer season whereas the southern hemisphere was experiencing the start of the Winter season. The Solstice which leads to the beginning of the Winter season in the southern hemisphere and to the beginning of the Summer season in the northern hemisphere had occurred on May 24, 2017. A Titanian season is particularly long since it represents about 7 Terrestrial years and a Titanian year represents almost 30 Terrestrial years. Image credit: NASA/JPL-Caltech/Space Science Institute. April 2, 2019 : Is The Likelihood Of A Subsurface Ocean Higher On Enceladus Than On Mimas, Tethys, Dione, Rhea Or Titan ? 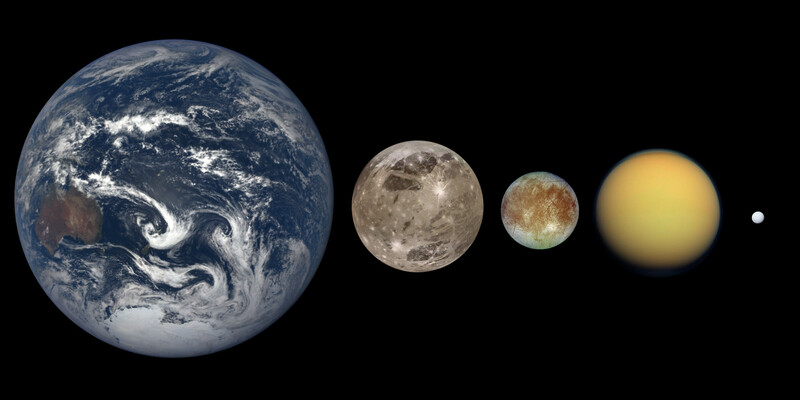 Planetologists believe that many worlds in the Solar System may harbor a subsurface ocean rich in liquid water. Around the Gas Giant Jupiter for instance, Europa and Ganymede may contain an ocean beneath their icy crust. The icy moons of the Ringed Planet Saturn may also contain an internal ocean. The tiny moon Enceladus where geysers or water plumes have been clearly identified during the Cassini mission appears to be the perfect candidate in the list of worlds or moons which may harbor a subsurface ocean rich in liquid water. The other icy moons of Saturn such as Tethys, Dione and Rhea may also contain a subsurface ocean even if its potential presence is harder to demonstrate than for the case of Enceladus. Titan which is the largest moon of Saturn and which contains lakes and seas of hydrocarbons on its surface is part of the list of worlds which may harbor a layer of liquid water beneath their external crust. Beyond Saturn, Triton, the largest moon of Neptune, Pluto, the largest Dwarf Planet in the Solar System and its main moon Charon may also contain a subsurface ocean dominated by liquid water. A new study entitled « Evolution of Saturn's mid-sized moons », recently published online in the journal Nature Astronomy and proposed by Marc Neveu and Alyssa R. Rhoden, reveals numerical simulations regarding the evolution of the geology and the orbit of several moons of Saturn for 4.5 billion years. In this study, the researchers focused their attention on Mimas, Enceladus, Tethys, Dione and Rhea. The moons undergo the influence of the gravity of Saturn and the other moons. The planetologists advanced that the interior of Enceladus, Dione and Tethys must be active thanks to tidal forces or gravitational phenomena. They pointed out however that Mimas may be inactive today even if it undergoes strong tidal forces related to its particularly high proximity to Saturn. They believe that Mimas must have formed relatively recently, between 0.1 and 1 billion years ago. The icy moons studied by Marc Neveu and Alyssa R. Rhoden are located between Saturn and Titan which are the most massive bodies of the system. The simulations bring major clues regarding the surprising difference between Enceladus which is remarkably active and Mimas which seems to be a dead world. The image above reveals the largest moons of Saturn at scale. From the left part of the view to the right part of the view, one can observe Mimas, Enceladus, Tethys, Dione, Rhea, Titan and Iapetus. Mimas is the closest moon to the Gas Giant whereas Iapetus is the farthest moon to the Ringed Planet. The moons are represented in an order of distance to Saturn from the left part of the view to the right part of the view. The dichotomy between Mimas and Enceladus in terms of geological activity draws the attention of researchers. Enceladus unveils geysers and fractures in its south polar region. The tiny moon may contain a subsurface ocean. By contrast, Mimas seems completely inactive. 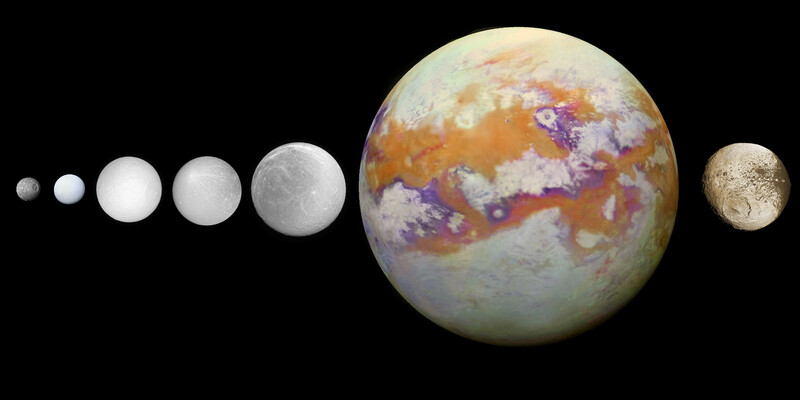 Credit for the original image of Mimas, Enceladus, Tethys, Dione and Rhea: NASA/JPL-Caltech/Space Science Institute; Credit for the original infrared view of Titan: NASA/JPL-Caltech/University of Nantes/University of Arizona; Credit for the original view of Iapetus: NASA/JPL/Space Science Institute; Credit for the montage: Marc Lafferre, 2019. A new research work entitled « Contributions from Accreted Organics to Titan's Atmosphere: New Insights from Cometary and Chondritic Data », released online in The Astrophysical Journal on January 22, 2019 and led by the Doctor Kelly Miller who is a research scientist in SwRI's Space Science and Engineering Division, reveals that the presence of a thick atmosphere on Saturn's largest moon may be closely related to the heating of organics in the interior of the Hazy Moon. Researchers are really fascinated by the thick, dense or deep atmosphere of Titan because most moons in the Solar System are devoid of any significant atmosphere. The other moons of Saturn are devoid of any significant atmosphere and are generally heavily cratered. The gravity of Titan is much weaker than that of the Earth but the air on the surface of the Opaque Moon is much denser than that of the Earth at sea level. In other words, the atmospheric pressure on the surface of Titan is much higher than that of the Earth at sea level. The Titanian atmosphere appears to be largely dominated by molecular nitrogen today. The team of Kelly Miller advances that there may be an outgassing process involving organics from Titan's interior which fuels, sustains or maintains Titan's atmosphere. The secrets of Titan's atmosphere may be found in the heating or « cooking » of organic material inside the giant moon of the Gas Giant Saturn. During the Cassini mission in the Saturn System, we have had the opportunity to realize that Titan is rich in hydrocarbons or organics. The concentration of methane in Titan's atmosphere can reach about 5 percent at the level of the surface. There are lakes, seas and rivers of hydrocarbons, dominated by methane and ethane, in the polar areas or in the high latitudes of the Opaque Moon. Kelly Miller pointed out : « Titan is a very interesting moon because it has this very thick atmosphere, which makes it unique among moons in our solar system. » She added : « It is also the only body in the solar system, other than Earth, that has large quantities of liquid on the surface. Titan, however, has liquid hydrocarbons instead of water. A lot of organic chemistry is no doubt happening on Titan, so it's an undeniable source of curiosity. » Due to the harsh environment, water can only appear in its solid form on the surface of Titan. The image above reveals a portion of the Gas Giant Saturn as well as the disk of its largest moon Titan approaching the Gas Giant. 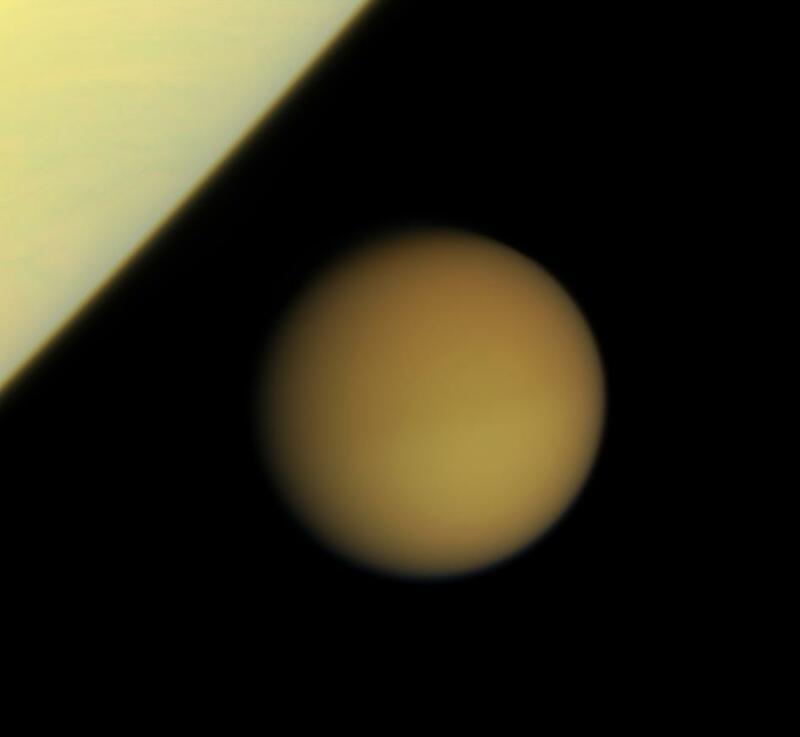 One can notice in particular the sharp contrast between the color of Titan's atmosphere, dominated by nitrogen and methane, and the color of Saturn's atmosphere, dominated by hydrogen and helium. This natural color view was generated on the basis of several images taken on January 29, 2008 with the Narrow-Angle Camera of the Cassini spacecraft using red, green and blue spectral filters. The views were captured at a distance of about 2.3 million kilometers or 1.4 million miles from the Opaque Moon. Planetologists try to determine whether the presence of the massive atmosphere of Titan might be related to the release of gases from the interior of the giant moon where heating processes may be encountered. Image credit: NASA/JPL/Space Science Institute. A new study entitled « Observational evidence for summer rainfall at Titan's north pole », accepted for a release in Geophysical Research Letters, a journal of the American Geophysical Union, and produced by a team of researchers led by Rajani Dhingra, a doctoral student in physics at the University of Idaho in Moscow, reveals clues or evidence of rainfall and changing seasons in the north polar region of the Opaque Moon Titan, on the basis of data acquired from the Cassini orbiter. The planetologists based their analyses on a particular image obtained with the Visual and Infrared Mapping Spectrometer (VIMS) of the Cassini spacecraft which can see in the infrared or near-infrared spectrum. Surface features on Titan can't be observed in the visible spectrum from outer space but with an infrared eye or a near-infrared eye, one can see through the hazy atmosphere of Titan and one can discern surface features such as lakes, seas, volcanoes, mountains or craters. The team of Rajani Dhingra clearly identified a reflective feature close to the north pole of Saturn's largest moon in a view acquired on June 7, 2016 with the Visual and Infrared Mapping Spectrometer of the Cassini orbiter. The reflective feature could be identified in the infrared or near-infrared spectrum, in a wavelength which allows researchers and the general public to discern landscape features and which brings an idea regarding the composition or the dynamics of the surface. The reflective feature represented, in surface area, about 46,332 square miles which represents, in surface area, approximately 119,999 square kilometers. That is the equivalent of the surface area of a square whose side is about 215 miles long or 346 kilometers long. In fact, the area of the reflective surface represents, roughly, half the size of the Great Lakes. That reflective feature didn't appear to be a permanent feature since it had not been observed in previous images of the area. Moreover, subsequent views of the region, taken from the Cassini spacecraft, didn't show the reflective feature anymore. As a result, that bright or reflective feature appeared to be transient. The image above reveals a portion of the Titanian disk generated on the basis of data obtained with the Visual and Infrared Mapping Spectrometer (VIMS) of the Cassini orbiter. The lower view shows an enlarged view of the area corresponding to the area of the blue box and of the orange box displayed in the upper view. One can notice the « wet sidewalk », ephemeral region likely representing the outcome of a past rainfall event and likely representing the sign of changing seasons. One can also notice several specular reflections as well as clouds. The mirror-like reflection of a pool of liquids known as Xolotlan Lacus can be identified. In the left part of the lower view, the famous sea called Kraken Mare can be discerned as well. The north pole of the Orange Moon is indicated by a black dot in the lower view. Image credit: NASA/JPL/University of Arizona/University of Idaho. A new study led by Paul Byrne, a planetary geologist at North Carolina State University, and recently presented at the annual conference of the American Geophysical Union in Washington, reveals that the well-known moons Ganymede, Europa, Titan and Enceladus may not be geologically and biologically active due to the relatively high thickness and stiffness of their crust. Let's point out, however, that Enceladus which is a tiny moon of the Gas Giant Saturn appears geologically active today but is it enough to allow the presence of a water-based life ? Ganymede and Europa which are moons of Jupiter as well as Titan and Enceladus which orbit around Saturn are believed to harbor a subsurface ocean of liquid water beneath their icy crust. Thanks to the Galileo spacecraft which had evolved inside the system of Jupiter and thanks to the Cassini spacecraft which had studied the system of the Ringed Planet Saturn, we have gathered clues regarding the potential presence of liquid water beneath the crust of several moons of those Gas Giants. The gravitational influence of the Gas Giants and of the other moons must play a key role in the dynamics of the internal activity of those moons studied by the team of Paul Byrne. The planets engender tidal forces like the tidal forces between the Earth and the Moon. There must be a lot of heat or energy inside those moons. During the previous century, we have sent robots, drones or submarines to explore the abyss of the ocean and we have realized that microorganisms or more complex animals can thrive in the hot springs or in the active volcanoes. Those hot springs shelter ecosystems that appear in a stable state thanks to chemosynthesis, in darkness, in the absence or quasi absence of solar radiations. As a result, can we find microbes or exotic organisms in the subsurface oceans that are believed to exist in the Outer Solar System ? The new work performed by Paul Byrne explores the dynamics of the outer crust of several moons and leads to the conclusion that those moons may not be active inside due to the relatively high stiffness and due to the relatively high thickness of the crust. The image above reveals the Earth, Ganymede and Europa, which are moons of the Gas Giant Jupiter, and Titan and Enceladus, which are moons of the Ringed Planet Saturn, at scale. The external crust of those moons may be too thick or too strong to allow the emergence or the development of an active geology or biology beneath their presumed icy crust. But the debate regarding the internal structure of moons in the Outer Solar System is far from being over. Credit for the original view of the Earth: DSCOVR, December 25, 2018. Source of the original view of Ganymede: Wikipedia. Source of the original view of Europa: Wikipedia. Source of the original view of Titan: Wikipedia. Credit for the original view of Enceladus: NASA/JPL-Caltech/Space Science Institute. Montage credit: Marc Lafferre, 2019.